ScotRail operates a fleet of forty Class 158 "Express" DMUs. These are allocated between Corkerhill Depot (formerly Haymarket) and Inverness Depot. The units are primarily used on long-distance rural services as well as short distance commuter services within the Central Belt. 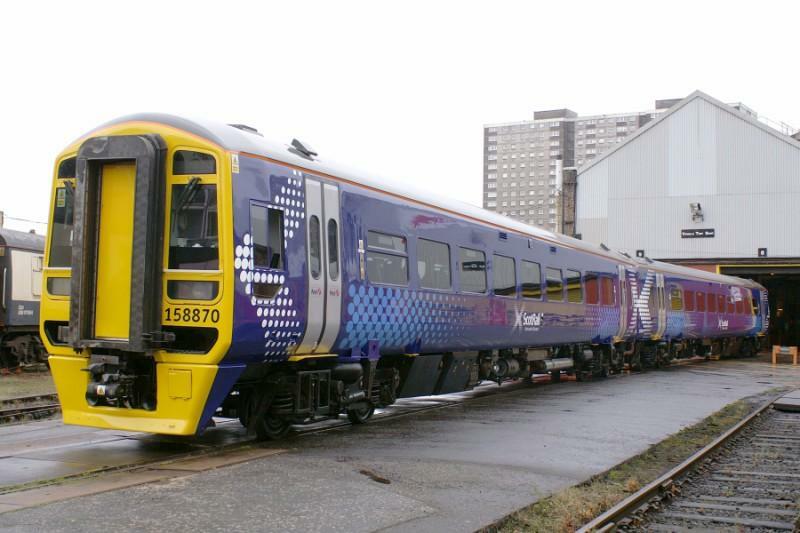 The Class 158s underwent a refurbishment programme at Glasgow Works, Springburn between 2015 & 2018. This included exterior repainting, a remodel of the interior seating arrangements and the new saltire moquette to go with. The Inverness sets were treated first, and the then Haymarket based ones were secondary. 158782, 158786, 158789 and 159791 arrived at HA on loan during February 2007. 158791 returned south to Northern on 3rd March 2007. 158867, 158868, 158869 and 158870 arrived at Haymarket on 14 December 2007 on long-term loan from Northern, an arrangement which was due to end in June 2010. However, a new agreement was made with the ROSCO and the units formed part of the ScotRail fleet and remained with ScotRail indefinitely. In 2010 the Angel Trains fleet were repainted into the TS Scotrail Saltire livery (and eventually fitted with the new standard oval LED lights), and all 8 units remained in Scotland until 2018 when they transferred to Arriva Rail North. 158789, 158867 & 158869 on 12th December 2018. Created by SC318250 and last modified by TheDustyBinman at 02:20, 22 of December 2018.